Industrial lighting leader, Larson Electronics LLC, has released a Class I Divisions 1 and 2 Groups C D and Class II Divisions 1 and 2 LED brick light that produces 6,250 lumens at just 30 watts. This portable LED light is mounted to an A-frame style base, providing explosion proof flood lighting for hazardous location environments requiring portable and durable illumination. 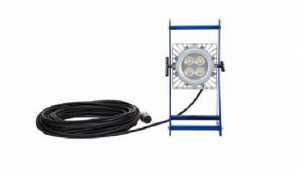 The EPL-PM-30LED-UVA-100-EPP is an explosion proof LED unit with a low-profile light head measuring just 7 inches squared,that is mounted to a portable aluminum frame base, allowing the light to be adjusted up or down 90-degrees. 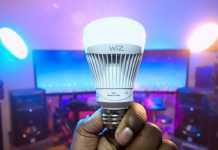 This 30-watt LED lamp provides 4,000 square feet of work area coverage and a hefty 6,250 lumens of light output. Special heat dissipating design and LED technology helps this fixture achieve an excellent 50,000 hour rated lifespan with 80% lumen retention. This light provides both a 60-degree and a 125-degree beam angle, ideal for wide coverage. The A-frame portable base is constructed of non-sparking aluminum and features a carrying handle on top for convenient movement. The frame is powder coated with a glossy blue finish for added durability and aesthetics. The LED light head is fabricated from copper free aluminum alloy. This light is universal voltage capable and can be operated with 100-277 VAC, 50/60Hz. A low voltage version of this LED fixture that operates on AC/DC voltages from 11-25 Volts is also available. This explosion proof portable flood lighting system is equipped with 100-foot of 16/3 chemical and abrasion resistant SOOW cord that is fitted with an explosion proof cord cap for easy connection to explosion proof outlets. “This LED provides operators with high output illumination for wide area coverage in hazardous environments in a compact, lightweight unit,” said Rob Bresnahan, CEO of Larson Electronics LLC. “The entire assembly weighs just about 15 pounds, allowing it to be easily lifted and carried where needed by the convenient handle at the top of the frame”, he added.